If you’ve ever been to an annual awards banquet, you’ve been to the Kiwanis Illini Basketball Banquet. Monday’s was the 92nd, and it was just like all the others. The faces change, the jokes and awards are all the same. Brian Barnhart emceed at the i-Hotel. Mike Thomas joined the basketball staff in recognizing the little people who make Illini basketball happen. Basketball office manager Julie Pioletti and university president's wife/longtime season ticket holder Cheryl Easter earned multiple mentions. About 500 people ate an extremely well-cooked piece of beef (possibly short ribs, it’s hard to say) over a bed of even better-cooked haricots verts. A few steeled themselves against the onslaught of name readings by downing a few bottles of beer (cash bar). But for the vast majority of attending non-participants, there was no need for dulling the senses. With an average age of 83, the audience was collectively thrilled to still be alive. It’s probably a great time to become a season ticket holder, member of the Rebounders Club, and general Friend of the Program. The on-court product will probably get better, eventually. And all the best parking spots will be relinquished because their current holders will be attending that wondrous Orange & Blue celebration in the sky. Speaking of the supernatural; John Groce is one of the Jesus People, as you may have grasped. He referenced god a couple of times during the night. This coming Friday, while a nation of shiksas and goyim pretend to be Jews, urging Pontius Pilate to “crucify him,” Illini players will be contemplating the implications of Groce’s speech. In a nutshell, he praised Jon Ekey and Joe Bertrand for relinquishing their starters roles, and added that next year will have a lot of similar opportunities for sacrifice. Groce prefaced his presentation of individual awards by saying he doesn’t feel it’s appropriate to present individual awards. He added that the MVP award had been changed to “most outstanding player” because no one is more valuable than anyone else. Groce wept (yes) when describing a picture he’d seen of Jon Ekey counseling Malcolm Hill, the man-child who supplanted Ekey. Groce thanked Ekey for making that sacrifice. Groce did not divulge which Illini might have the chance to be next year’s lamb. It’s hard to imagine Kendrick Nunn losing any PT after emerging as the Illini’s most reliable offensive weapon, especially when considering that it was Nunn’s defense that won him a starting job. It’s hard to imagine Malcolm Hill’s role getting smaller, considering the variety of awards (statistical & subjective) he received at the banquet. It’s impossible to imagine Nnanna Egwu’s role diminishing, considering Groce’s steadfast affinity for Egwu’s defensive prowess. So who’ll be sacrificing PT? Will the team’s most outstanding player, Rayvonte Rice, play fewer minutes next year? Is it three-year starter (and 2012 MVP) Tracy Abrams who’ll find himself playing Quinn Richardson to Ahmad Starks’s Derek Harper? Abrams’s decision-making, and ability to pass the ball after drawing defenders into the lane, will determine his PT next year. That’s what I take from Groce’s comments. 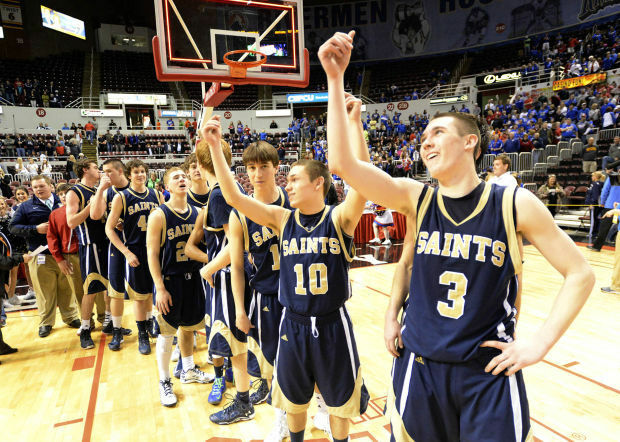 Kathi LaTulip reports that Mitch LaTulip won an IHSA state championship in basketball. Bloomington Central Catholic beat Nashville 76-62 in triple overtime. Darius Paul was the largest person in the room. Nnanna Egwu is very tall. So is Maverick Morgan. But Darius Paul was the largest person in the room. After the Clemson game, Jon Ekey said Darius could be a great rebounder if his conditioning holds up. Since then, Paul’s weight gain has been a frequent topic of speculation. He’s put on 29 lbs. while sitting out his transfer year. Brandon Paul came along for the party. His left arm has been mounted in a stabilizing sling for 30 days. He said there’s no pain, but he’ll be glad when the contraption comes off tomorrow. You’ll recall he suffered a partial tear to his left labrum, earlier this year. Lynda & Cliff Paul Sr. were also in da house. The sat with the Tate contingent, and Jamall & Rebekah Walker. Lynda and Rebekah topped the fashion awards, which is not unusual. Unfortunately, I didn’t get a decent photograph of Lynda’s smashing canary yellow dress, nor Rebekah’s orange, white and blue houndstooth. Shame on me. Cliff Paul Jr. was not able to attend. He's working for a tech startup, which is just about the only thing which could stop him from accepting a free meal. James Colbert will be in a better mood next year, if his son Austin gets any playing time. James joked derisively about Austin’s game poster, wondering how anyone was able to capture an image of Austin actually playing in a game situation. Tracy Abrams Sr. attended. I’ve never seen him before. He seems like a joyful personality. And he’s no taller than 5’9”. For a guy who opens every public appearance with a trio of ancient, well-worn classical hand-tooled jokes; you’d think this might have happened before. But as far as I know, Mike Thomas has never said something funny. But then Thomas revealed a prank he’d played on Malcolm Hill, just before the festivities began. He said he took Malcolm aside, and revealed the tradition of having one player from each class give a speech on behalf of that class. Thomas told Hill that he would be the representative speaking on behalf of the freshmen. According to Thomas, Malcolm blanched at the suggestion. Lorita Bertrand with Joe and Jon Ekey. Jerry and Barbara Steele (John Groce's mom) with Maverick and Jeff Morgan. The Abrams Womyns. The Rice Womyns.